Hard Chrome can be applied to a wide range of industrial sectors. Surface coating with hard chrome provides properties in terms of resistance to corrosion and wear, without compromising the characteristics of the basal metal. Also, Hard Chrome has also a wide variety of properties and desirable characteristics. Hard Chrome Plating is an electrolytic process utilizing a chromic acid based electrolyte. The part is made the cathode and, with the passage of a DC current via lead anodes, chromium metal builds on the component surface. A wide variety of parts can be coated; it requires only the proper fixturing, a large enough bath, sufficient lifting capacity, and adequate power sources. Hard Chrome Plating offers many attractive properties to the engineer. Before plating, the substrates are exposed to thorough cleaning, so that the surface to be coated is completely free of contaminants. However, the final adhesion is achieved in the coating bath itself; with an initial reverse voltage removes any residual surface contamination. Chromium can be deposited on a wide variety of metals. Steels, Stainless steels, Copper and Brass are the most receptive metals for an adherent deposit. Aluminum and the more exotic metals, such as Inconell, Hastalloy and Titanium are more difficult to plate, but with the proper pre-treatment methods an adherent deposit can be achieved. Even under high contact stress provides a very low wear rate , with abrasive products like textiles, paper and food stuffs. With thick deposits, it gives excellent wear resistance under high stress contact against sand, coal, cement, limestone, glass fibers, etc. 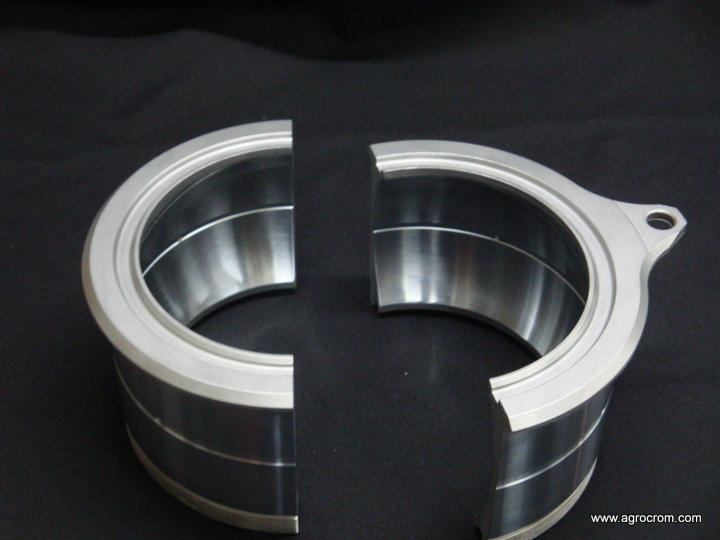 With abrasion being the most common and destructive wear process found in industry, hard chrome has the potential of solving many problems in pumps, valves, bearings, etc. Over a wide range of industries, including pharmaceuticals, chemicals , oil and gas , textiles , printing, food, mining , aerospace and many others. The temperature does not have any effect during the process on the properties of the substrate since it does not exceed 60 ° C.
With careful attention to anode design and fixturing, chrome plating can be applied evenly to flat surfaces, to fine bores, even with large aspect ratios, to cylindrical like shafts or rollers, and to holes and close tolerance areas. It’s suitable for most organic acids and gasses (not chlorine), excellent in hot oxidizing or reducing air, in commodities like beer, sugar, brine, coal gas, cyanides, fruit acids, molten glass, glue, milk, oils and fuels. Copyright © 2019 Welcome to AGRO CROM. Proudly powered by WordPress. BoldR design by Iceable Themes.